1. We talked about the fact that you slept for hours. There are two possible interpretations for this sentence. 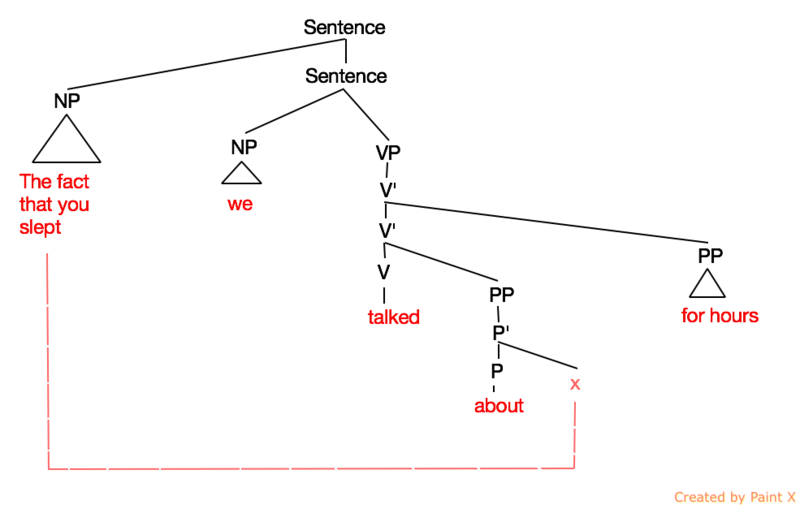 One is where the PP for hours modifies the verb talked. One straightforward interpretation is that we talked for hours about the fact that you slept. We can just say that the PP for hours modifies the verb talked. The other interpretation is where you slept for hours and we talked about it. The PP for hours must now be modifying the verb slept. 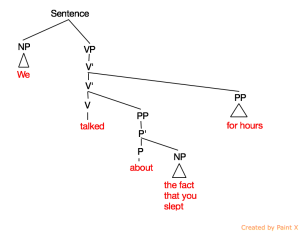 In this example, the PP for hours is modifying the verb slept inside a rather complex DP/NP. 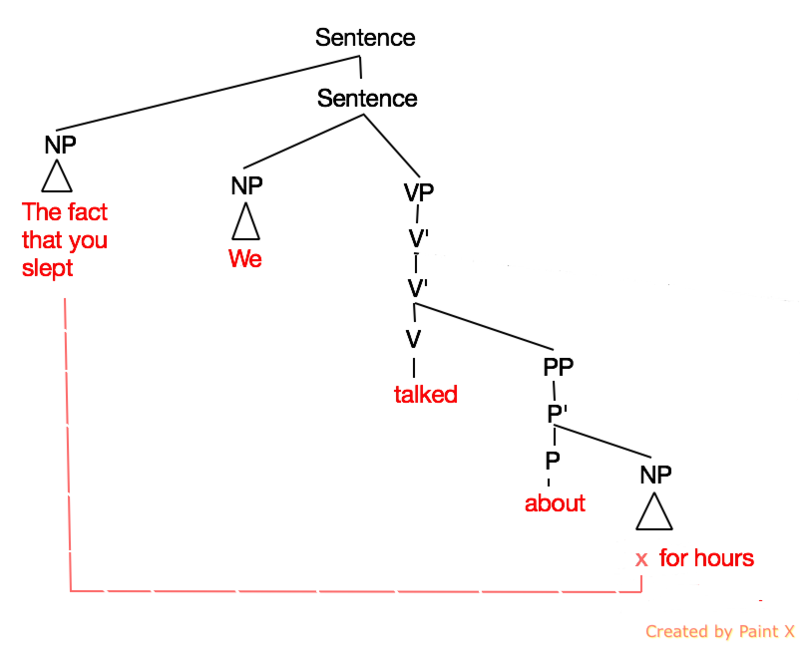 Something quite interesting happens if you move one of the DP/NPs to the beginning of the sentence. 2. The fact that you slept, we talked about for hours. 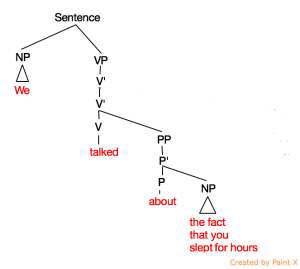 Now, there is only one interpretation available, with the PP for hours modifying the verb talked. 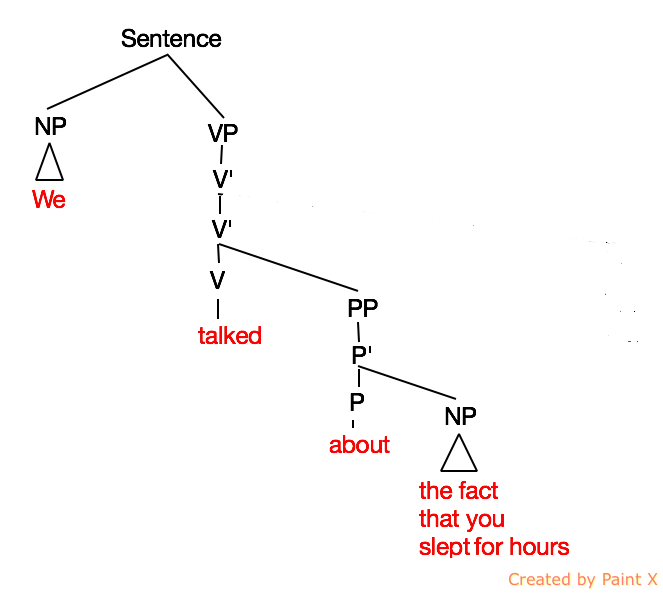 If the DP/NP the fact that you slept is moved to the beginning of the sentence, there is only one possible interpretation. We talked for hours. It doesn’t mean you slept for hours. A movement explanation can handle this quite simply by saying movement cannot take place out of certain islands. DP/NPs are barriers as far as movement is concerned. 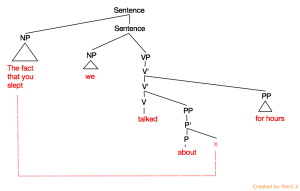 In this example, we are trying to extract the preposed DP/NP out of a DP/NP. 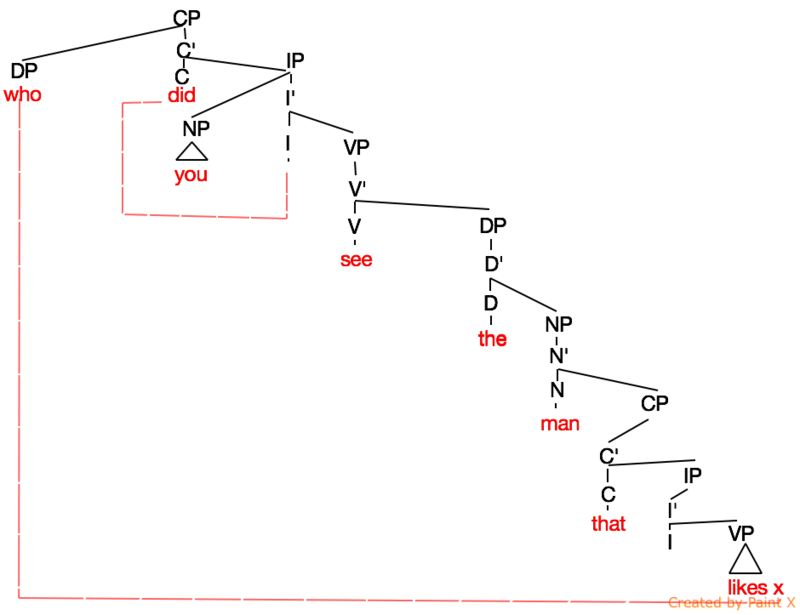 The resulting interpretation is not possible. It seems that DP/NPs are barriers to movement. Look at the following examples. 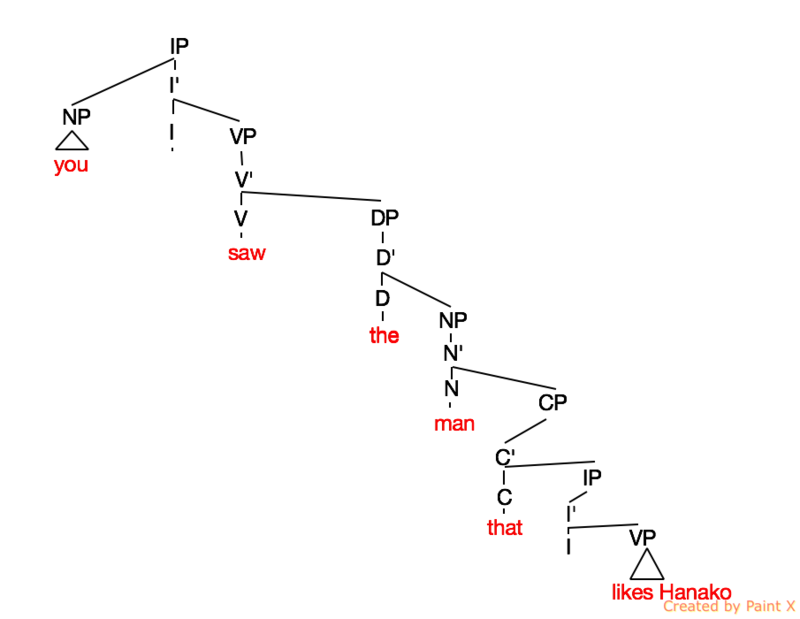 A sentence such as “You saw the man that likes Hanako” is perfectly fine. 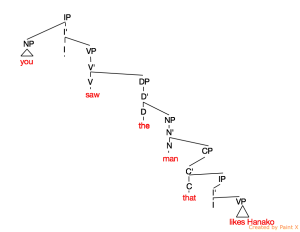 However, try to move a wh- expression out of a complex DP/NP. It doesn’t work. 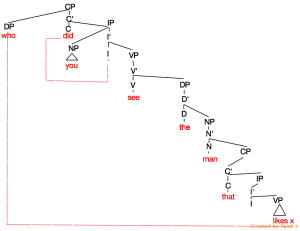 “Who/x did you see [the man that likes x].” Pulling expressions out of DP/NPs doesn’t work.